Jagruti's Cooking Odyssey: Butternut Squash Raita(Dip) and My Experiance watching MNIK !!! Butternut Squash Raita(Dip) and My Experiance watching MNIK !!! Went to see yesterday MNIK (MY NAME IS KHAN) !!! really I don't prefer to watch movies in the first week, coz gets really over crowded, I prefer some breathing space as people sitting nearby suffocates you with sneezing and coughing, also inconsiderate parents allowing their kids sitting behind kicking your seats, endless disturbance! If a person has a disability of some sort and does unusual things everybody reacts to it but when normal people behave unjustly in public places like cinemas, It is just not right ! !during my movie yesterday I had to break my silence and asked the two ladies sitting next to me to stop making noise with their crisp packets, which went on for ages and it was just driving my patience. So I bravely spoke out to them !! I would like to ask you fellow bloggers Did I do the right to speak out to them inconsiderate people or Should I have kept quiet? (Snack which makes irritating noise should be eaten before the movie starts or during interval) Because of such distractions in cinema, I prefer to watch movies at home in my own comfort zone!! Now coming to my recipe, Butternut Squash Raita which my Mum used to prepare, it was her favourite. Very healthy, light, slightly sweet and creamy. This raita is very easy to digest. 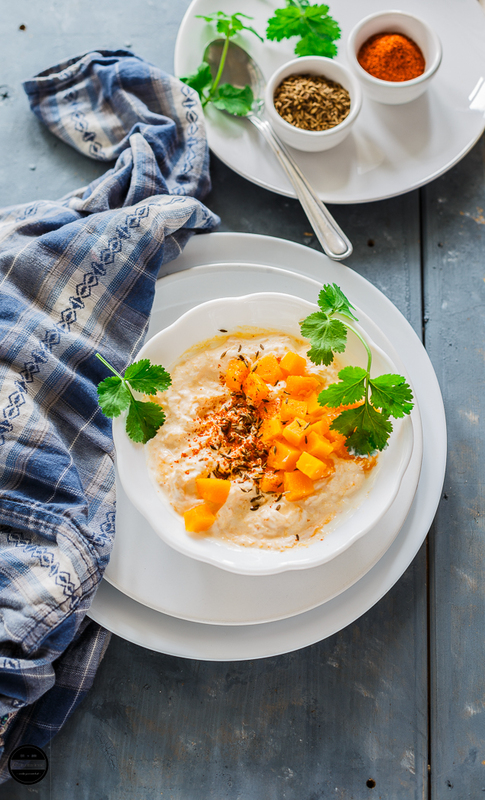 So quick and easy recipe which can be consumed during the fasting period too. Instead of butternut squash pumpkin can be used for this recipe. 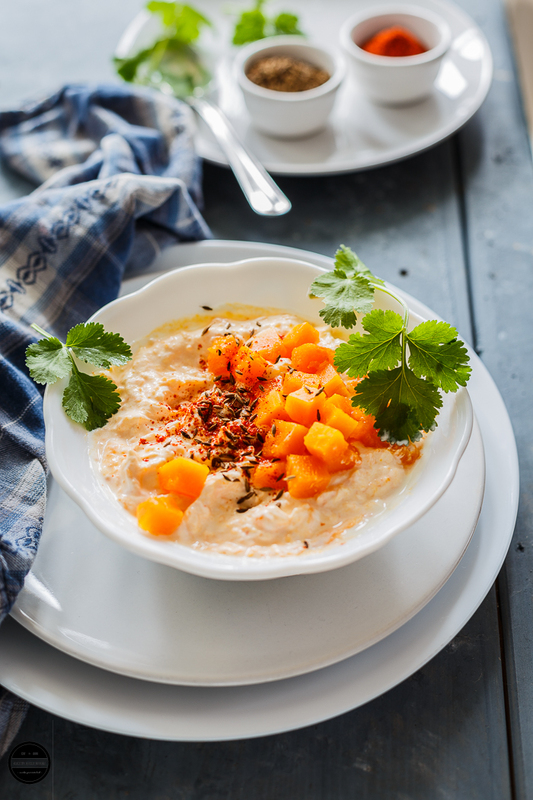 This very popular Butternut Squash (Kaddu) raita is a delicious and easy recipe prepared with boiled butternut squash, creamy yogurt, and other basic but flavourful ingredients. 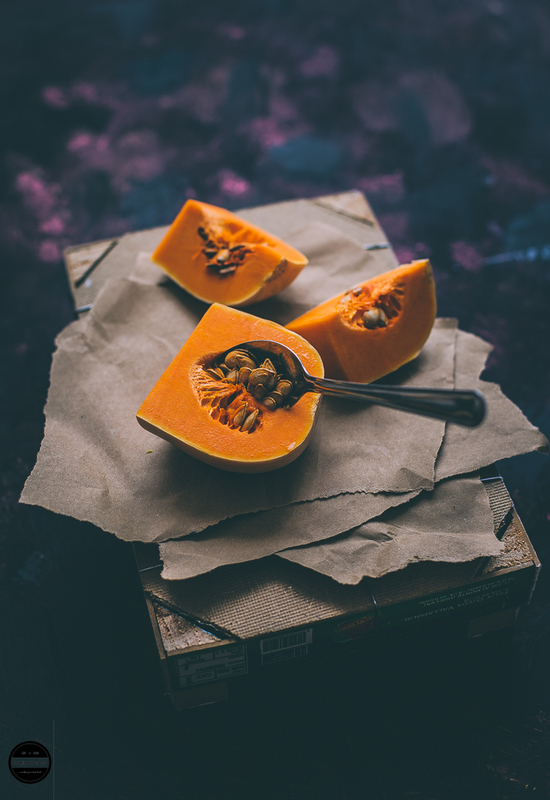 Cook Butternut squash in a microwave with little water till tender about 6-7 minutes or cook on a stove until well done. Mash well and leave a side.when it gets cool add yogurt and all the other stuff. mix well and it's ready. this raita complements really well as a side dish with the rest of the meal.Enjoy! Sending this Raita to Mahimaa's event Cooking Basic Event . With summer approaching will look forward to such coolant raitas. I agree it's irritating at times especially when it comes from grown ups, I think telling politely to stop it is a right thing. u hve described beautifuly the experiance....and nice recipe tooo..
@ Pari; that's what I did !! @ Vanilla' people bring their own crisps packets which makes noise,coz cinema food is expensive..
hey.. nice raita.. loved the pic..the presentation.. i can get the smell of roasted cumin..
U did right by asking them.. everybody has the right to enjoy movie but not at the stake of others.. Btw, did u like it? It found it too dragged and didnt understand why Karan Johar had to bring in the hurricane? @ J; You are right.. Ya I did found bit dragged and ya why hurricane? if srk can reach there why can't any gov. help? aahhh..such refreshing pachadi, sad to hear your bad day at cinema..actually I imagined the whole scenario and now I am laughing..but its ok to speak out if people bother so much..
Lovely raita! Yes, people shd be reminded sometimes to behave! Yummy , creamy and delicious..
healthy, easy, delicious and what not? I think you did the right thing.. that was just telling them about what should be common sense. 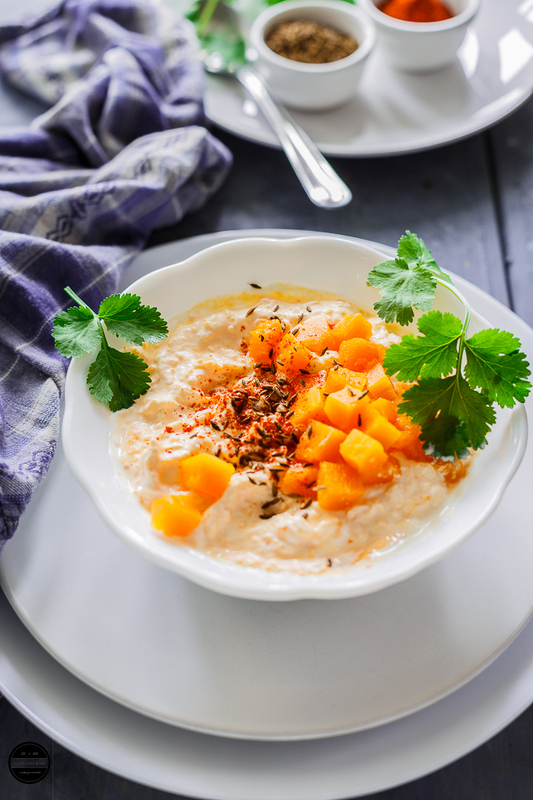 Butternut squash raita looks so delicious! Never thought of using butternut squash in this way..
this is so easy and delicious recipe..loved it..n i think u did d right thing..sometimes its better to speak up! Hi there, lovely refreshing raita...it is tough when people behave badly in public places...well, I hope they stopped bothering you after you told them. 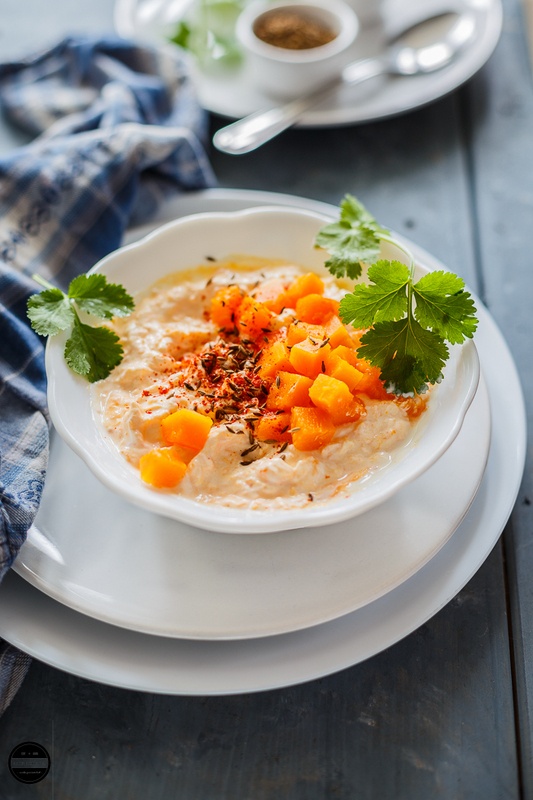 Anyway coming back to the topic your raita looks yummy.I bought butternut squash today its huge and was wondering what dishes I can make with it,its too large just for curry.Thanks for this raita I will surely try it. U r rite, sweet heart!..i too hate people doing that..people even tell dialogue's of the upcoming scene..(they wud have come for second/third time)..this really is annoying! !..multiplexes here dont have plastic packs!,,anyways hope u liked the movie..
Raita looks so cooling and refreshing, dear! What's MNIK? I am out of touch. I watched Paa on my 60" Plasma too, much better than going to theater unless it;s like 3D movie. Delicious soup, great for sipping spponfuls and watching movie. Raita looks yummy ,Sad to hear about your bad day, i believe you did the rt thing. omg i totally agree what you said about the disabled people.. so unfair right? and you definitely did the right thing..
Thats a delectable and rich raita Jagruti, i stopped watching movies in theatre, coz i cant resist to noise the other's makes and sometime we cant even the cinema silently...that too here in France, its really very hard to watch out movies in theatre..
Oops! I typed in the whole story of that movie too! HeHe! Will leave the end in suspense next time, I promise! Do watch it though, it's a good movie. Raitha looks nice, we just make the usual one with cucumber nah? never tried a raitha with butternut squash. Will try next time! quick 'n easy 'n healthy dish... & hey u did the right thing by asking them to keep quiet... People should learn to be considerate of others at public places like cinemas..
Nice Write up,I know how annoying it could be,I definetly make a point if some thing really bugging me in a humble way only if the movie worth it:-)U were perfectly right there.. This Raita is new to me ! Will try it sometime. About MNIK .. even I watched it yesterday and loved it .. how bout u ? This is delight full and Joanne being ur fren too, am inviting u here for her little party which is a suprise party for her ...do leave her a wish in the sprinkles ok.....my feeds arent working so am trying my best to find all her pals to leave her a wish in the sprinkles before she gets there or even after....will ya help too to make it a little sucess....and leave her a wish too? Came here to leave u this note and saw ur reply-our multi plez doesnt allow outside food u know...he he he...arent they smart to kepp their counters ringing? thanks...I'm relieved now after reading all your reactions!! Actually my hubby who bought the tv and system..he loves all these type of stuff.. I definitely would have spoken out as well! You are paying to see that movie and so you should enjoy it without interruptions! This dish looks amazing. I am passionate about butternut squash and have never seen it used like this. It is bookmarked! Raita is fav with paratha or roti. this is a new Raita will definitely try this. very new recipe to me.. never made it. thanks a ton for your entry.. would love to try. I have been thinking about making something with pumpkin for some time now and good to get this idea from you. Good, you spoke out to the ladies. I get irritated when someone kicks the seat, specially when they are not kids. Coming to your recipe its absolutely delicious, my granny used to make this during shravan month, it tastes yummy!! Such a welcome change to a same old boring raita!! Droolsome pictures! What a beautiful colour! I've never tried this before, can't wait to try it -looks wonderful! Very innovative idea. I will try this for sure. Beautiful pictures. These looks delicious.